One of two new solar arrays, known as 4A, delivered to the International Space Station (ISS) this week by NASA's STS-115 crew rolls out to expose one mast bay on Sept. 14, 2006. The biggest and brightest manmade object orbiting Earth just got bigger and brighter. 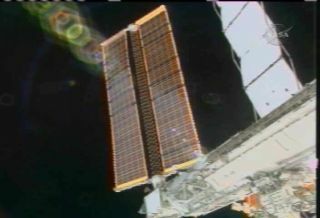 Astronauts on board the International Space Station (ISS) unfurled a new pair of solar energy panels that sprout out of the end of a new 17.5-ton truss section, which was brought up by the space shuttle Atlantis. They are the largest solar panels ever taken to space; fully unfolded, they reach a length of 240 feet (73 meters). They are designed to double the ISS's capability to generate power from sunlight when they go online during a future shuttle mission. The panels are made of layers of thin gold Mylar plastic, which are highly reflective [photo]. Like other satellites, the ISS shines by virtue of sunlight reflected off of its metallic skin. The station orbits approximately 213 miles (341 kilometers) above Earth. Before the ISS spread its new pair of gold wings, it was already the brightest of all space vehicles, at times appearing to shine with a brilliance equal to the planet Jupiter. Now skywatchers should notice the orbiting outpost glowing with an even greater luster. Nobody knows exactly how much brighter it will be, but there's a good chance that it could be brighter than magnitude -3, approaching the glow of Venus, the brightest planet. On this astronomers' scale, smaller numbers denote brighter objects, and negative numbers are reserved for the handful of the very brightest. And the ISS will likely get even brighter. The solar panels are only the second of four planned arrays that will be deployed between now and before the shuttle fleet is retired in the year 2010. Skywatchers across much of North America will have opportunities to see the ISS in the coming weeks. To the unaided eye, it appears as a large "star" with a yellowish-white tint that moves with a steady speed across the sky. Beginning late next week and running through the first two weeks of October, early risers will be able to look for the station in the dawn twilight if skies are clear. Starting in mid-October, it will make passes during convenient evening hours, soon after sundown. To find out if the International Space Station will pass over your hometown, go to NASA's tracking page or the Heavens Above web site. Amateurs with large telescopes and some knowledge of astrophotography have in the past had success photographing the space station. A special class of satellites, known as Iridiums, can actually appear to flare in brightness rivaling the ISS and Venus, but only for brief flashes.